CNNSen. Cory Booker appears on CNN. Democratic Sen. Cory Booker was pressed on CNN Thursday over legislation he supports that would bar individuals on the FBI terrorist watch list from purchasing firearms. Appearing on “Legal View,” the New Jersey senator was asked to respond to criticism from his Republican colleagues who fear “no fly, no buy” legislation could wrongly strip some Americans of their Second Amendment rights. Democrats have renewed calls for such a law in the wake of the Orlando terror attack. “This is what the Republicans on the other side of your debate are saying. In one circumstance, it’s not a constitutional right to get on a plane, but in the other circumstance it is a constitutional right to get a gun and that it’s not quite that simple. Do you at least sympathize with that side of the debate?” CNN host Ashleigh Banfield asked. Booker said that he takes “every amendment seriously,” but argued no right was absolute. Banfield continued to press Booker on the subject. 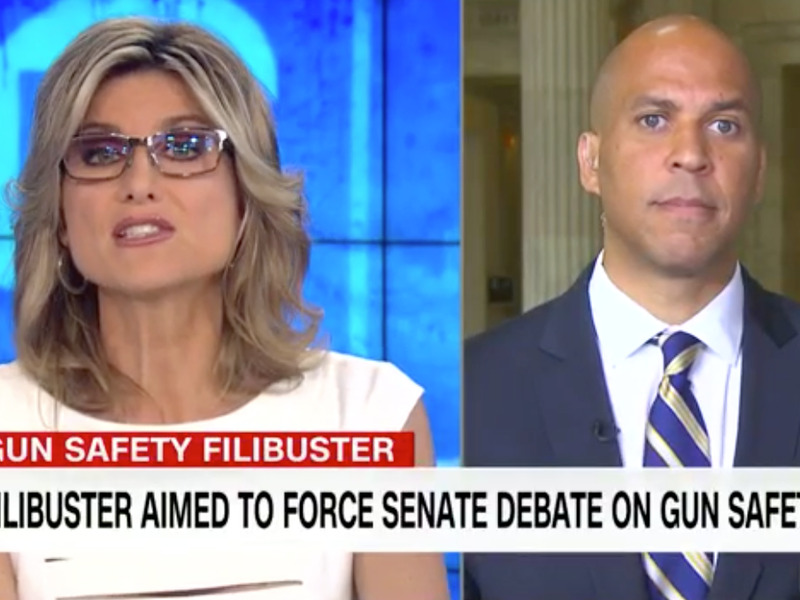 The CNN host said she felt “reasonable minds can differ” from Booker’s position and used an illustration of a single mother to make her point. “Well, it’s not problematic. And, in fact, the Feinstein bill understands that mistakes are made and there should be a reasonable process to grieve this and get back on,” Booker replied. He added that the odds of the terror watch list legislation affecting a single mother who sought to purchase a firearm for defence would be very low. “Hold on. Hold on, hold on. And I — and I’m being clear with you that that is a small group of people and the Feinstein legislation has due process elements baked into it so that person can grieve that and do it,” Booker countered. Booker added that Republican-backed legislation introduced by Sen. John Cornyn would create a “really impossible hurdle for the FBI” to stop a suspected terrorist of obtaining a gun.